Captain America fights for justice with superhuman strength, agility, and an indestructible shield! He's America's first Super-Soldier, fighting fearlessly on the side of justice. 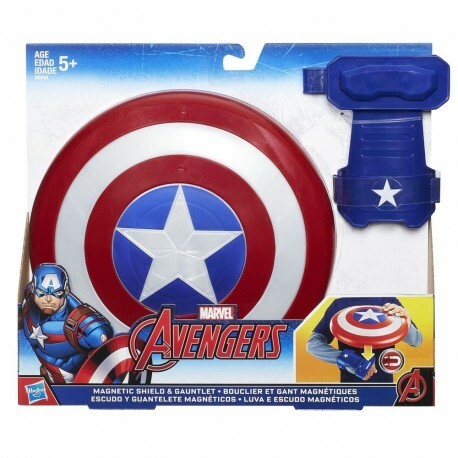 With this Captain America Magnetic Shield and Gauntlet, kids can imagine what it's like to be Captain America! The shield attaches to the magnetic wrist gauntlet like Cap's shield -- and can be thrown as a disc when removed, like Cap throws his shield in battle! With the Captain America Magnetic Shield and Gauntlet, aspiring heroes can imagine what it's like to join the battle for justice as the Avengers' most patriotic Super Hero. 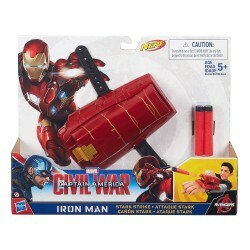 Includes magnetic shield and gauntlet.